Raise Data Recovery for JFS was designed for data recovery from JFS file system and reconstruction of JFS system even in severe cases. You can recover accidentally deleted, lost and corrupted files from hard disks, removable storages, disk images and virtual disks of virtual machines as well as separate partitions formatted with JFS file system. With RAID Access Plugin - RAID Builder you can apply the program to complex RAID-systems as well. ...... Using additional tool - RAID Access Plugin - RAID Builder - you can apply the program to complex RAID-systems as well. Raise Data Recovery for JFS allows to reconstruct JFS file system even after severe damages caused by formatting hard disk, hardware malfunctions or software failures, virus attacks, power outages etc. For enhanced convenience the software identifies other file system types - Windows (FAT and NTFS); Apple Mac OS (HFS+); Linux (Ext2, Ext3, Ext4 , Reiser, XFS) and FreeBSD (UFS/UFS2) - to help you detect your file system type and select proper data recovery software. 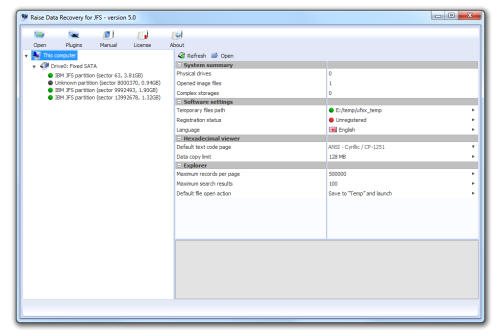 JFS file system features good chances for recovery of file contents with one disadvantage - file names can be recovered incorrectly. Raise Data Recovery for JFS employs latest developments in the field of data recovery that allow to achieve maximally possible data recovery result from JFS file system. Qweas is providing links to Raise Data Recovery for JFS 5.2 as a courtesy, and makes no representations regarding Raise Data Recovery for JFS or any other applications or any information related thereto. Any questions, complaints or claims regarding this application Raise Data Recovery for JFS 5.2 must be directed to the appropriate software vendor. You may click the publisher link of Raise Data Recovery for JFS on the top of this page to get more details about the vendor.